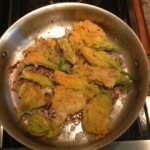 These pumpkin blossom fritters are a delicious way to get a broad spectrum of nutrients into your diet (via a broad spectrum of colors in your fruits and vegetables) and are a great way to celebrate the last days of summer! I was able to get the pumpkin blossoms at the Farmer’s Market since I’m not growing pumpkins this year–which is a nice way to support Jeremy, one of our local farmers at Crackin’ Hen Farms. Just dredge the blossoms in beaten egg (yes, with the yolk–that’s the most nutritious part!) 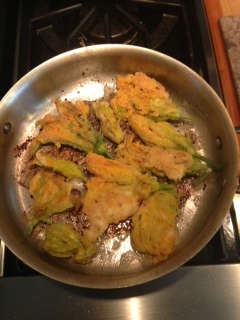 and then dredge again in the flour of your choice (I like brown rice flour) and fry them in quality fat. I used leftover bacon grease (from happy, grass-fed pigs), but grass-fed butter or coconut oil would work well, too. When they are lightly brown on both sides, sprinkle generously with sea salt and get yours fast–the whole family will love this delicious and nutritious treat!